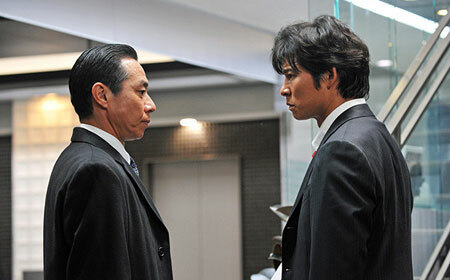 Toshiro Yanagiba and Yuji Oda prepare for the end in Bayside Shakedown 4: The Final. The Skinny: Decent sequel in the Bayside Shakedown franchise that oddly disappoints because it touts itself as "The Final" and yet doesn't bring any of its long-running subplots and themes to a satisfying end. Still great for fans, but a fifth film would be a fine idea if actual closure were in the offing. by Kozo: The Bayside Shakedown (a.k.a. Odoru Daisousasen) series reaches its inevitable and some might say merciful end with Bayside Shakedown 4: The Final. Trumpeting closure to the adventures of Wangan Police Station detectives Shunsaku Aoshima (Yuji Oda) and Sumire Onda (Eri Fukatsu), Bayside Shakedown 4 delivers progression to the series’ theme of teamwork vs. bureaucracy, but offers the same old routine with its characters and their relationships. The result is a decent entry in the series that’s more focused than the fan service-heavy third film. And yet, as the supposed end to the whole Bayside Shakedown series (which spanned a 12-episode TV series, numerous specials and 6 films including spinoffs), it doesn’t satisfy. Despite being “the final”, the Bayside Shakedown formula is ultimately left so intact that the series could easily go on. When we last left our Wangan Police Station heroes, they were doing what they’ve pretty much always done: solve crimes with passion and heart while dealing with ever-intrusive bureaucratic bean counters. Then a big crime occurs, followed by an escalating soundtrack and lots of people running around hurriedly. A murder and then a kidnapping are reported in the area, bringing the Metropolitan Police to the Wangan District, where they can oversee the investigation and push the meddling local cops aside. Aoshima and company, including Shijiro Waku (Atsushi Ito) and Natsumi Shinohara (Yuki Uchida), are asked to just look after the office but get involved in the investigation anyway, only to realize that something more sinister may be going on. Clues point to the involvement of a police officer, and there may even be a cover-up stretching to the highest levels of federal law-enforcement. What follows is a tense, sometimes dour thriller occasionally interrupted by comedic or maudlin moments. Now installed as the Wangan Police Station’s commander, Masayoshi Mashita (Yusuke Santamaria) spends his time attempting to flatter the visiting Metropolitan Police, while his underlings work to cover up a pallet of beer cans they mistakenly ordered. These workplace shenanigans should be familiar to the Bayside Shakedown faithful because they’ve been rehashing them for pretty much forever. Also rehashed: characters who soul search about their careers as underappreciated policemen – especially Sumire, who’s essentially sidelined from the film’s main action by her personal subplot. The filmmakers do a good job of hiding Eri Fukatsu’s reduced role by making sure she turns up at key moments. Still, not having Sumire, the series’ lead female (not to mention Fukatsu, arguably the series’ best actor), around for the full 2+ hours is very disappointing. Also disappointing is the fact that all this soul-searching leads nowhere. Characters threaten to retire, quit or do something besides clock in every day to selflessly fight crime, but actual change is rare. Some characters get promotions, like honorable metropolitan cop Shinji Muroi (Toshiro Yanagiba), who once again spends the entire film locked in a room with a bunch of other suits. However, by the end of the film Muroi is, like Aoshima and Sumire, more-or-less doing the same thing he was doing when the film began. The progression given to the film’s teamwork vs. bureaucracy theme is just a promise for the future – and it’s only a slightly stronger promise than the ones given in previous films. This is a “final” film in the series, so more should have been done with Aoshima, Sumire, etc., but none of the key characters undergoes any notable or lasting change.